I first worked for Suzanne James over a year ago via an agency, but in December 2015 I joined the company as a full time employee! I love the challenges and the lack of routine. When you work as a chef you need to be ready for absolutely everything and you need to work solutions out really fast. This can seem very stressful but I really love the feeling I’ve got when I look back and I see how I have overcome problems. What do you love to prepare? I love all food, so I am happy whatever I am doing! But I really love to do experiments mixing Spanish and English culture. The lack of some ingredients from my culture make me try different options and a lot of the time I end up getting incredible results. I am so pleased and excited to have created a special Spanish menu for East Dulwich Supper Club, I hope that everyone will enjoy it, and for the rest of the team it will be a chance to maybe experience the creation of some different dishes! Any seafood, but especially prawns and bream with a good Spanish wine of course! I have to say with my grandfather. He is 102 years old now, but I would wish to have the kind of dinner we used to have more than 30 years ago. At that time I was a teenager and he used to go fishing early in the morning. I was always fascinated to see what he had caught and would help him to clean the fish before we would cook it together for dinner. He was a big influence in my life and my decison to become a chef. I did my training in Spain in a city called Santiago de Compostela. I moved there for five years to study hospitality and tourism whilst specialising in cooking. I worked in Spain as a chef in social services, such as elderly homes, shelter centers or nurseries. Then, I moved to London and here I discovered my passion for fine dinning as I started to work in restaurants. for the last two years I’ve been working as an agency chef for many different venues; catering companies, corporate clients and hotels. Believe or not… I like cooking! But I like to do it with my partner at our own peace. He always asks me for things that challenge my cooking skills and I love to try them with the peace of mind that if I don’t get the perfect result the only person who will be upset will be me – with myself!! What's the hardest thing about being a chef? The unsociable hours. It makes very difficult to socialise with friends and family. They do not always understand why I cannot meet at the same time as everyone else – this is something that has caused me to loose many friends sadly. I would be a nutritionist. 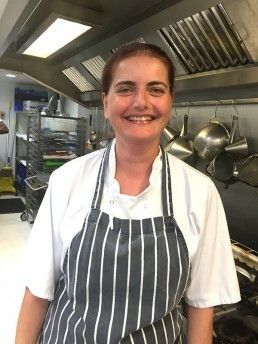 Apart from studying as a chef, I’ve recently taken a degree in Human Nutrition with the intention of teaching children how easy is to cook and to eat healthy – I hope that in time this means I can get move involved with the Suzanne James Food Foundation and the Grow, Prepare, Cook & Share Project. In your opinion what makes Suzanne James different from other catering companies? The family environment. We are like a big family looking forward to meeting each other. We work closely, as a team, to make the events real – to make dreams come true for our clients. When you are very busy or tired you can be sure there will always be someone willing to help you. Nowadays, it is really difficult to find that environment at work.